Serving nearly 1,000 students district-wide, the District 300 Dual Language Program aims to ensure that all linguistically diverse students receive a quality education that enables them to succeed academically, close the achievement gap, and attain proficiency in English and Spanish socially within a culturally supportive environment. The Dual Language Program is a form of bilingual education where students are taught literacy and academic content in two languages (English and Spanish). The District 300 Dual Language Program offers students a unique opportunity to excel academically while learning a second language. Who can enroll in the Dual Language Program? The Dual Language Program is open to any students (grade K-3) whose primary language is not English. Native English speakers must enroll in the Dual Language Program at Kindergarten. How can students enroll in the Dual Language Program? For students whose home language is not English, eligibility is determined by criteria established by the Illinois State Board of Education in accordance with Illinois Administrative School Code 228. Students determined to have met enrollment criteria may seek placement in the Dual Language Program. Students entering kindergarten whose primary language is English are invited to fill out an interest form and may be enrolled based on eligibility and program capacity. Interest forms are only available at Dual Language informational Nights (Dates will be posted at d300.org). Dual Language students learn the same curriculum standards as their grade-level peers through classroom instruction that follows an 80:20 Spanish/English Language model. As the chart above indicates, classroom instruction for all kindergarten and 1st grade students would be taught in Spanish 80% of the time and in English 20% of the time. 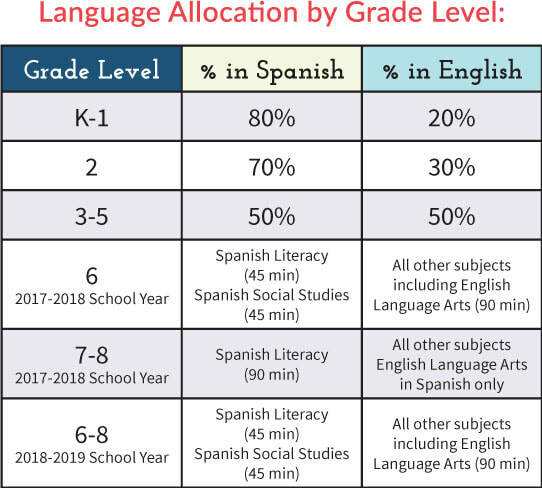 Dual Language Programs follow a content allocation plan to indicate to grade-level bilingual teachers when to teach in English or in Spanish. Dual Language Programs offer both one-way and two-way immersion models. The goal of both models is to promote high academic achievement, first-and second-language development, and cross-cultural understanding for all students. One-Way Immersion is an educational model in which the student population includes English Learners only. Two-Way Immersion is an educational model that integrates native English speakers and English Learners in the same classroom. To inform how well Dual Language students perform in comparison to a native speaker. To inform the proficiency level of Dual Language students as bilingual readers. District 300 uses a variety of academic measures to the monitor progress of all learners. In order to make sure students are on track with their learning, District 300 uses local assessments to measure linguistic and academic growth. To measure biliteracy for emerging bilingual students, teachers assess each child’s literacy skills holistically, determining their reading, writing, listening and speaking skills in two languages. What does the Research say about Dual Language Programs and its Benefits? Research shows that there are fewer high school dropouts from Dual Language Programs than from other programs. By late elementary school, Dual Language students of varied backgrounds achieve at or above their non-Dual Language peers in general education classes. Most Dual Language students expect to attend college. Thus, not only do Dual Language Programs appear to improve academic performance, but may also enhance job opportunities.